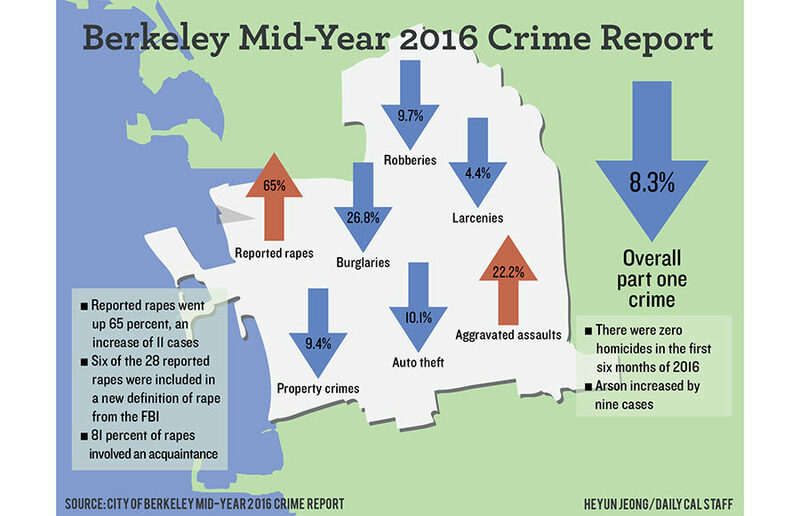 Overall crime in Berkeley was down in the past six months, according to a semi-annual Berkeley Police Department report. 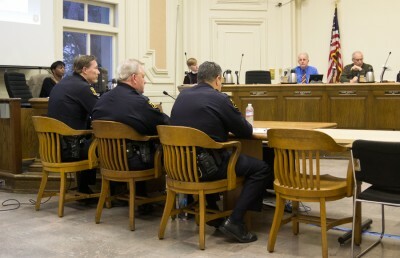 The report, which is set to be presented to City Council on Tuesday, shows that while overall rates of Part One crime — defined as violent and property crimes — have decreased in the last six months, aggravated assault, arson and sexual assaults have all increased. Councilmember Kriss Worthington said he is glad that Part One crimes are down, but there is a lot more that the community needs to do. In 2015, Part One crime increased by 16.1 percent from 2014. Because of the jump in crime, BPD emphasized in last year’s report the importance of preventative efforts against crime, such as checking surroundings and locking doors and windows. BPD Capt. Andrew Greenwood has previously said that 45 percent of that year’s burglaries occurred in unlocked homes. Overall, Part One crime decreased in the past six months, including a decrease in robbery, burglary, larceny and auto theft. Sexual assault, however, increased by 65 percent in the first six months of 2016, compared to the first six months of 2015. According to the report, the FBI revised the definition of sexual assault in January 2015, making it more inclusive by encompassing all genders and different types of assault, which boosted the reportable sexual assault statistics nationwide. Additionally, Worthington said recent efforts to encourage reporting of sexual assaults and greater bystander awareness may have contributed to the increased number of reported incidents. In order to combat the influx of sexual assault cases in Berkeley, BPD has added another fulltime sexual assault investigator to the Special Victims Unit. Worthington said even with the increase in reporting, sexual assault is still likely “grossly underreported” and adding another investigator is an important step, but the city should continue efforts supporting prevention. BPD has partnered with UCPD to increase awareness about sexual assault, especially among new students and members of fraternities and sororities, though UCPD spokesperson Sgt. Sabrina Reich said the details of their partnership plan have not been finalized. The report noted that many of the aggravated assault cases involved homeless and mentally ill victims or suspects. Of the arson cases, three involved a suspect with a previous history of arson and five involved subjects with known mental health issues. Contact Gibson Chu and Pressly Pratt at [email protected].